N-TRON™ was founded in 1999 as a developer, manufacturer, and marketer of Ethernet network equipment for industrial applications. Their goal is to be internationally recognized as “The Industrial Network Company”. 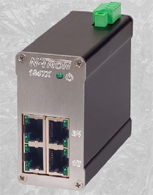 The 104TX is a low cost unmanaged four port Industrial Ethernet Switch. It is housed in a hardened, metal, DIN-Rail enclosure and is designed for use in mission critical data acquisition, control, and Ethernet I/O applications. The 105TX is a low cost unmanaged five port Industrial Ethernet Switch. It is housed in a hardened, metal, DIN-Rail enclosure and is designed for use in mission critical data acquisition, control, and Ethernet I/O applications.